The first 3 weeks of the challenge is done and so far I have kept up! Just barely but I managed. Now it is time for Part 2 of the challenge where you have another 3 weeks to make 3 calendar pages!! Even if you didn't get the first 3 done jump right in and you will be closer to having a Calendar done which is the perfect Christmas Gift. For my inspiration I used Sketch #36 from Sketch -N- Scrap. What is so awesome about this site is that it has BOTH card and scrapbook sketches. The best of both worlds all in one place!! to make and complete a calendar by September. I figured we can do 3 pages in 3 weeks....surely we can! For every page you enter during those 3 weeks (up to 3 entries) you will be entered into a drawing for a $5.00 gift code for digital stamps at Clearly Digi Stamps. Then in September we should have a completed calendar! There will be a grand prize!! Anyone who completes a whole calendar (12 pages) will be entered into a drawing to win 1/2 the amount of Clearly Digi Stamps that you used on your calendar. So if you use 12 Clearly Digi Stamps to make the calendar you will win 6 Clearly Digi Stamps of your choice!! You don't have to use CDS images to enter but it will get you more CDS stamps if you win the Grand Prize. 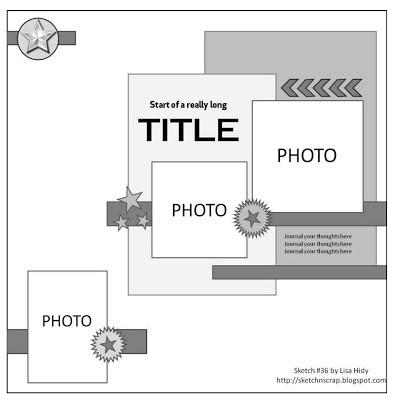 Prize: $5 gift code to Clearly Digi Stamps for digital stamps. * You don't have to make the pages in order. So start out with any month that you have inspiration for! You may enter the Calendar challenge up to 3 times per post. Lovely take on the sketch! Calendars are such an awesome gift especially handmade ones! Thanks for using our sketch! Pheww. I made it. only a few days to spare.